Another Beautiful Day in Paradise. We had clear blue skies, temperatures in the high 60s and a good breeze out of the SE. 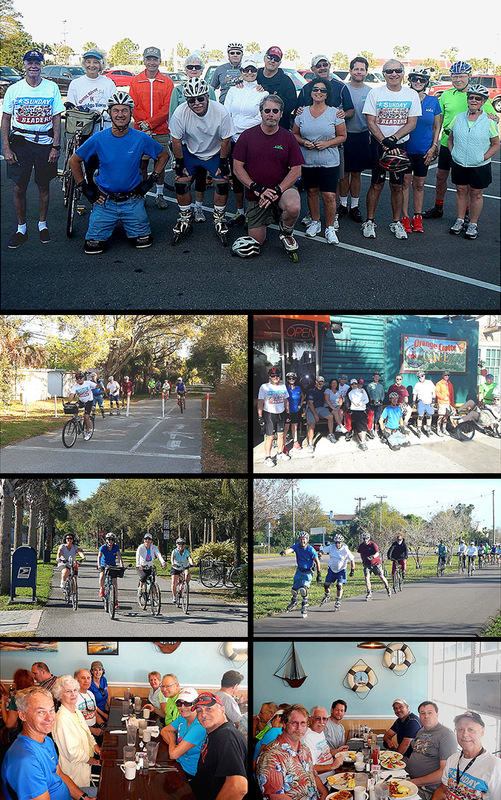 Bicyclers/Bladers Bruce M, Diane & Bill S, Carol J, Nick S, Ginnie S & Rick P, Rob & Amie H, Dimitri F, Herb E & Leslie R, friends of Herb Ted & Janice, Jeff B, Dee T and Joseph W came. Welcome all. We decided to head South so the wind would be at our backs on the return. Most all did the round trip of 10.4 miles. We had 3 bladers & 14 bicyclers. Herb E and Alan B renewed their Sponsorships this last week. Thanks Herb and Alan for the website support. We Brunched at Benedict's as planned. Benedict's was very busy and it took us quite a while to get in and seated at two tables. The service wasn't that great but okay. Coffee flowed pretty good. The food was good as usual and both tables rated it a 9.5.